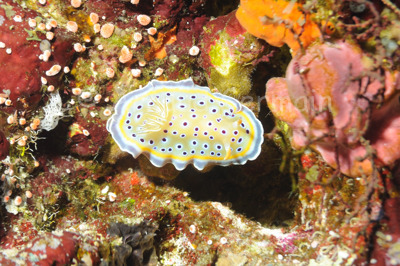 One of my favourite nudibranchs in the Red Sea. As we were drifting along the Eastern Drop-off in Elphinstone Reef, hoping to see sharks and big pelagics, I spotted this beautiful nudibranch on the wall. I had to fight the current to stay put and take a few pictures. Nikon D700, Nikon 28-105 mm macro at 105mm, F5.6, 1/60th, ISO 200, Ikelite Housing and Ikelite DS160 strobe set on Manual x1/8.